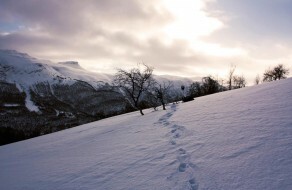 Many people love to backpack and camp in the winter. The cold air and the freezing temperatures just give them a different kind of experience. However, backpackers and hikers often aren’t prepared for situations that could arise in these cold conditions. Winter introduces many beautiful scenes, but this solitude makes cold weather backpacking even more challenging and dangerous. Before you head out, be sure to check the weather forecast for the area you will be backpacking in. Besides snowy and cold conditions, watch for below freezing temperatures, storms, wind, and cloud cover. Cloudy skies actually make for warmer temperatures, as the clouds keep in the heat. Check with the local rangers or park officials for a more detailed forecast. 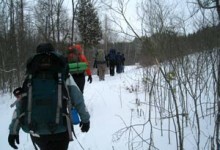 Most people who die backpacking in winter die from hypothermia after getting wet, resulting in lower body temperatures. Because of this reason, it is essential to not let snow soak into your clothes and reach your skin. Jeans are the worst at this as they are easily soaked, they keep the moisture in, and they don’t dry quickly. Don’t just bring a rain jacket and expect that to do the job. Remember, it is harder to warm up after getting cold than just staying warm in the first place. Once clothing gets soaked, try any way possible to dry it. At night before going to bed, change into dry clothing and set wet clothes out to dry. Warm cold feet through inertia by forcefully swinging your leg back and forth, like a pendulum, to rush blood to your toes. Layering clothing is also very important in order to trap heat in and insulate your body. However, another mistake many backpackers make is trying to keep in too much body heat. When dress too warmly, your body begins to sweat. Perspiration and moisture will then wet your clothing. Monitor your warmth and remove layers of clothes if you begin to sweat. Avoid clothes that are non-wicking, such as cotton, which don’t let the moisture escape. Instead, wear synthetic fabrics such as polypropylene. Also, always wear a hat and gloves, as these are two areas where most of your body heat escapes. Drinking melted snow is highly inefficient, so plan on bringing just as much water while winter backpacking as any spring or fall backpacking trip. Warm liquids will warm you up, but cold water works just as well and keeps you hydrated. Frozen water, however, won’t do you any good. Bring plenty of water, but keep it from freezing. This could mean keeping it inside your coat, in your sleeping bag with you, or in the middle of your backpack. Food is also a very important part of creating body heat. When you digest food, the calories produce energy and heat. This is why whale blubber is eaten in many arctic areas. Army survival courses teach soldiers to eat large chunks of butter to stay warn in winter conditions. For backpacking purposes, you can have olive oil on your pasta or eat oily foods like corn chips to get the same warming effect. 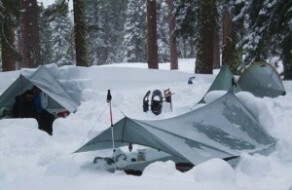 You should always bring a winter tent while backpacking in freezing conditions. But even with this, you should still learn to build survival shelters in cold temperatures. Learning how to make some of these simple shelters is smart planning for possible emergencies. If it isn’t snowing or raining, a simple shelter of sticks covered with piles of dry leaves, grass, broken branches, and other plants can insulate you enough from the cold ground. In worse conditions, you can build a shelter using snow blocks. Stomp out blocks using your feet or tools and surround your tent or shelter to block wind and keep heat in. Practice doing this in case of an emergency survival situation. Keep in mind that although temperatures tend to lower at higher elevations, cold air also collects in the bottoms of valleys and other low-lying areas at night and into the morning. Finding a level area, although out of the wind, is best. Many backpackers get by with no stove in the warmer months, simply eating cold, dry foods, but in winter a cooking stove is essential. Not only can it provide you with warm food and drinks, it can create enough heat to warm your body in freezing conditions. As stated before, melting snow for drinking water is highly inefficient, but with a stove this is a possible solution to getting water. Always have enough waterproof matches, a lighter, and other methods to start a fire in case your stove doesn’t work. A fire can easily be a lifesaver if you fall into a stream of lake and need to get warm and dry quick. Read our How to Build a Fire article to learn how to make the perfect backpacking campfire. Apart from these basic principles of staying warm while backpacking and camping in the winter, there are many other little tips and tricks you can learn and use. Fully fluffing up a sleeping bag, for example, makes it more effective in trapping the warm air in. Doing sit-ups in your bag before going to sleep is another technique which gets you a warm start to the night. Some water bottles or canteens can be filled with hot, but not boiling, water and even be kept in the bag with you.